The Golden State Warriors are the reigning kings of the NBA and they don’t appear to be slowing down any time soon. 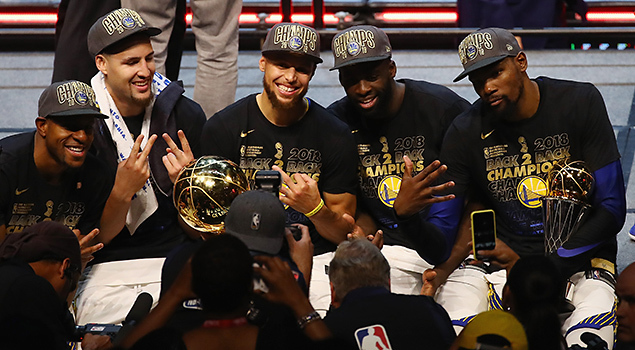 The Warriors captured their third NBA championship in four seasons and the core of basketball’s latest dynasty, Steph Curry, Kevin Durant, Klay Thompson and Draymond Green, are all in the prime of their basketball careers. This is not good news for the rest of league. The fear around the league when Durant joined a 73-9 team back in 2016 was that Golden State will have a huge competitive edge over everyone. Well, that fear is now being realized. The Warriors are 32-6 in the playoffs the last two seasons with Durant, and they could very well have won four straight championship if not for the “LeBlock” and Kyrie Irving’s 3-pointer in late in Game 7 of the 2016 NBA Finals. When a reporter asked LeBron James what’s the difference between the 2016 Warriors and the 2017-18 Warriors, he had two words: Kevin Durant. The addition of Durant makes it almost impossible to beat the Warriors. Durant had a pedestrian game by his standards in Game 2 of the 2018 NBA Finals, but Curry had his back to the tune of a record-breaking nine 3-pointers — five of them came in the fourth quarter. When Curry and Thompson struggled against the Cleveland Cavaliers in Game 3, Durant jumped into the driver’s seat, dropped 43 points, and drove the Warriors to a Game 3 win in Cleveland. “At the end of the day, if you want to win a championship or compete for a championship you have to go through the champion. And they’re the champions,” said James, who is now 3-6 in the Finals and three of the losses came at the hands of the Warriors. So how do you beat a team with four future Hall of Famers and a roster sprinkled with role players with extremely high basketball IQs? The challenge for LeBron and the rest of NBA appears daunting. To dethrone the Warriors, you have to be perfect. Not nearly perfect. Perfect. There is no room for error. LeBron recalled his battles with the San Antonio Spurs in 2013-14 as a member of the Miami Heat. The Spurs didn’t beat themselves. Every possession was crucial, and they make you pay for every mistake. Now, multiply that by 10 and that’s how it feels to play these Dubs. “The margin for error is very slim,” said James, who admitted that the mental stress of playing against the Warriors is more taxing than the physical stress of the game. LeBron and the Cavs thought they had played the perfect game against the Dubs in Game 1 of the 2018 NBA Finals. LeBron had a game for the ages as he scored 51 points. But it still wasn’t enough as the Cavs lost in overtime in a game that will forever be remembered for the reversed block-charge call on James and J.R. Smith’s blunder at the end of regulation in which he thought the Cavs had the lead and dribbled the clock away. LeBron was so upset after the game that he reportedly punched a white board.